Geese rising, Yolo Bypass Wildlife Area (Photo by Wildlife Area Manager Dave Feliz). 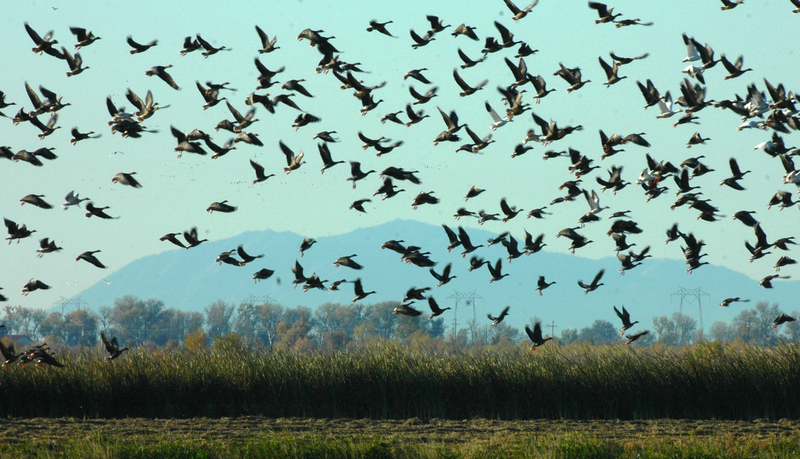 Answer: Waterfowl and migratory bird regulations are set by the U.S. Fish and Wildlife Service. While there are no minimum distance requirements specified in the regulations, it’s clear that you may not keep the floating corn feeder on another pond if it in any way influences waterfowl to come into shooting range for hunting. Even if the feeder is just intended to be for wood ducks, anything that can be determined to be bait that influences waterfowl of any species to come in within range for the purposes of hunting them could be considered bait and is illegal. This principle applies even if the feeding station or baiting is on a neighbor’s property. While hunters may not have control over what a neighbor is doing, they do have control over hunting on their own property or hunt club. Hunters may not shoot any birds that come into range if those birds are being influenced to come in for bait, even if on another’s property. In addition, all feed or bait must be removed 10 days prior to hunting over it, and the responsibility to know it is all gone is upon the person hunting over its influence. Answer: Many people refrigerate lobsters for a while to slow them down before putting them in boiling water, according to Senior Invertebrate Specialist Kristine Barsky. It sounds like you are trying to pith the lobster, or destroy its brain, as is sometimes done with frogs in a classroom situation. Barsky says she hasn’t heard of using that method on lobsters, and she thinks the quickest way to dispatch a lobster is probably still the traditional boiling water method. Empty Shell Casings as Trail Markers? Question: One of my favorite hunts is for upland game in Federal Wilderness (National Forest) Areas. Often I’ll leave my spent shotgun shells on the ground or trail to mark the exact spot where I saw game earlier. The casings serve as a reminder for me when I later hike back out. I eventually pick up my spent casings but know that many hunters and other hikers disapprove of seeing the colored shotshell casings on the ground. The fact you “intend” to retrieve the casings is not a valid excuse, according to retired Capt. Phil Nelms. Technically, if you are dropping the empty cases and leaving the area, you are violating the law. Instead, I suggest you mark your trail by clearing small spots of ground or by using natural objects that are readily available in the immediate area, like rocks or twigs. You might also want to consider a GPS to help with your navigation. Answer: There’s a wide variety of movement decoys on the market today. According to Northern Enforcement District Chief Mike Carion, wind powered decoys and decoys that vibrate, flap, wiggle or produce a motion other than spinning are all legal to use at any time, but decoys that feature any type of motorized spinning blade are prohibited before Dec. 1. Your motorized decoy is spinning a blade-like device that just happens to be in the shape of a duck foot … so you’ll have to wait until December to use it. This entry was posted in Bait, Decoys, Firearms/Ammunition, Food/Health, Lobsters, Waterfowl and tagged baiting, Duck Hunting, feeding ducks, litter, mechanical duck decoys, motorized duck decoys, preparing lobsters, regulations, shotgun shells, upland game hunting. Bookmark the permalink.